Barry Monda encourages anyone missing out on God’s wonderful gifts to get a fresh start – a second chance – to overcome addiction, sin, corruption and failure. We all know someone with life-controlling problems that are looking for a way out. Barry Monda’s new book, Breaking Bad - Answering the Call through Hell and High Water, ($12.99, paperback, 9781498467698) tells his story of dreaming about becoming a famous football, basketball, or baseball player, but finding himself a player in the life of addiction. He was a drug addict who lived a backslidden life for many years. He admits there were many times that he should have been found dead, ended up in prison, or infected with AIDS. While away from God, God wasn’t away from Barry. His life is proof that God can redeem and restore lives. Barry wants others to know God can do that for them too. It’s never too late. Barry Monda’s amazing story encourages readers to stop just merely surviving and start truly living. God’s grace and mercy to Barry was amazing … even miraculous. Barry Monda is so overwhelmed with what God is doing in his life. He and his wife, Melody, live in San Antonio, Texas. Xulon Press, a division of Salem Media Group, is the world’s largest Christian self-publisher, with more than 15,000 titles published to date. 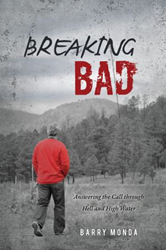 Retailers may order Breaking Bad - Answering the Call through Hell and High Water through Ingram Book Company and/or Spring Arbor Book Distributors. The book is available online through xulonpress.com/bookstore, amazon.com, and barnesandnoble.com.